In the spring thousands of songbirds fly to Colorado and nest. One of those birds is the Yellow headed Blackbird. 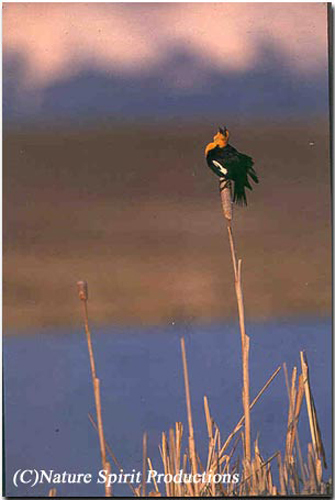 It is a Neo-Tropical migrant to most high mountain wetlands and some plains riparian locations as well. This bird is most beautiful with it's brilliant yellow head. It is very efficient at catching mosquitoes an larvae of many aquatic insects. This moment was captured in the North Park of Colorado. What you see is the Essence of a high mountain wetland, with the magic of light working on the "Marsh Migrant".